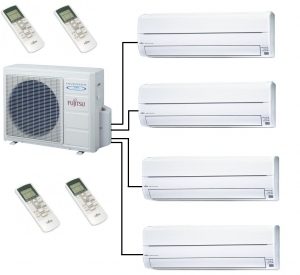 The AOYG30LAT4 outdoor heat pump and air conditioner unit can run four indoor units. You can run a variety of output sizes of wall mounted units off the system. A rated for energy efficiency this system can run in either cooling or heating mode, saving up to 40% in energy costs compared to electric only heating or cooling devices.